It was common to see Filipino laborers gathered in the lobby of the Eastern and other hotels in the District, the barber shops, and street corners to exchange gossip, read newspapers, and get caught up on the latest news. King Street in the 1930’s was like a barrio in the Philippines, noted a visiting Filipino journalist. At night, it was making the rounds of gambling joints, movies, or dance halls in the area. Rizal Hall (near Sixth and King Street) was like a Filipino community center where lively music constantly played. Victims of racial discrimination and exploitation, Filipinos found refuge in the International District, if only for a short moment. It was also in the District’s hotels that labor organizing fermented and where the likes of Carlos Bulosan and other Filipino labor leaders sharpened their tactics to achieve just working conditions and fair wages for farm and cannery workers. 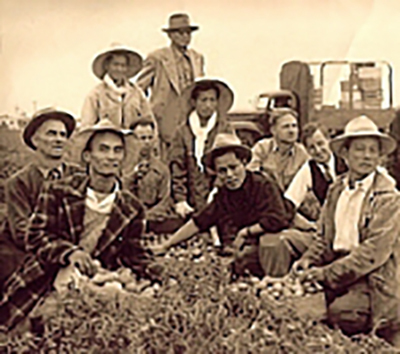 Filipino workers became a significant labor force by 1920’s and in 1933 formed the Cannery Workers and Farm Laborers Union, which later became Local 37 of the American Federation of Labor. In the 1930’s, the union hall had a storefront at Fifth and Washington; their alliance with the American labor movement was established. Forty years later, Silme and Nemesio Domingo formed the Alaska Cannery Workers Association with an office near So. Jackson and Eighth Avenue. The Association filed landmark class-action discrimination suits against the New England Fish Company and other large canneries in Alaska, and won. To this day, migrant workers still come to the hotels in the District as a stopping place to find work. Older Filipino migrant workers still reside in the District. This is their home. These Pioneer Alaskeros and farm workers, some who have worked in the migrant stream for 50 year, survived and fought this labor system. Their struggle, and that of their compatriots before them, left a legacy that continues to inspire the continual fight of all workers for just and fair work standards for all of us. They made a significant contribution to the labor movement and have helped crafted a better America.